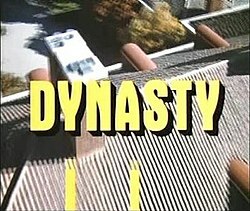 In September 2016, it was announced that a Dynasty reboot was in development at The CW, co-written by Josh Schwartz, Stephanie Savage, and Sallie Patrick. The project received a series order in May 2017. 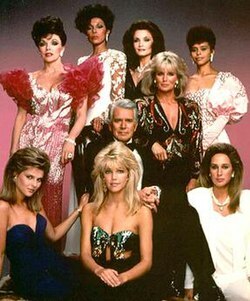 With the Shapiros also producing, the new series finds heiress Fallon facing off against her soon-to-be stepmother Cristal, a Hispanic woman. The CW's Dynasty features Grant Show as Blake, Nathalie Kelley as Cristal, and Elizabeth Gillies as Fallon. Other cast members include Sam Adegoke as Jeff, Robert Christopher Riley as Blake's chauffeur Michael, James Mackay as Steven, Rafael de la Fuente as Sam Jones, a gay male version of Sammy Jo,Alan Dale as Carrington majordomo Anders, Nick Wechsler as Matthew Blaisdel, Brianna Brown as Claudia, Wakeema Hollis as Jeff's sister Monica Colby, and Nicollette Sheridan as Alexis. ^ Harmetz, Aljean (October 31, 1985). "A Rule on Kissing Scenes and AIDS". The New York Times. Hollywood. Retrieved August 8, 2015.